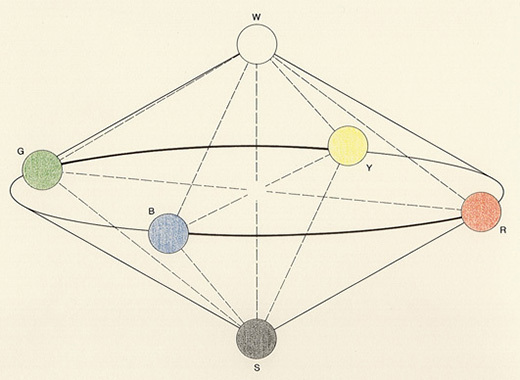 The «Natural Colour System NCS» originated in Sweden and, in common with Ewald Hering’s opponent-theory, operates with the six primary colours proposed by Leonardo da Vinci (text). Preliminary research work also employed Tryggve Johansson‘s system and Sven Hesselgren‘s colour atlas as precise references. The project was initiated in 1964, with results being submitted by Anders Hård and Lars Sivik towards the end of that decade. The objective of the Swedish colour researchers was to establish a colour-system with which a user with normal colour vision could determine colours without the need for colour measuring instruments or colour-samples. The NCS system is designed as an aid to defining the colour of a wall in a room, a distant tree, a painted surface exhibiting simultaneous contrast or a point on a television screen purely on the basis of its perception and does not involve the mutual comparison of a series of colours («colour matching»). The natural colour system possesses the external shape of a double-cone and is so constructed that the four psychological basic-colours of yellow (Y), red (R), blue (B) and green (G) occupy the circular base while taking up evenly spaced positions. The tips of the double-cone are either white (above) or black (below), and an equilateral triangle is formed by connecting each of the four basic colours to these two achromatic tips (below right). This triangle specifies the tints of a colour. The perceived proportions of white (W), black (S) and colour (C) are shown. The colour positioned at the outermost point to the right can then be identified using the parameters S = 10, W = 10 and C = 80 (with all three numbers, of course, totaling 100). With the NCS colour-circle, each of the quadrants is subdivided between two basic colours by a scale which expresses the portion of each colour as a percentage: Y40R implies a yellow with 40% red, and B20 G implies a blue with 20% green. This allocation is based on the principle of similarity — a concept which states that each colour is similar to a maximum of two chromatic elementary colours (in addition to white and black) and that such a match can be quantitatively assessed down to an accuracy of 5% without referring to a physical standard. Such estimations should be feasible with observers who have little experience in dealing with colours. All variables in the NCS system are likewise defined by means of similarity. Colour-hue, for example, is achieved in the way described above. As the coordinates Y30R imply, the colour orange could have a 30% similarity to red and 70% similarity to yellow. 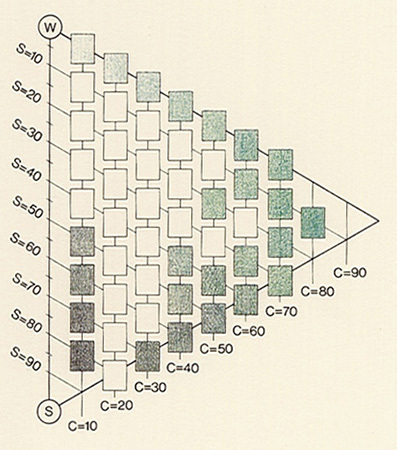 The other variables are chromaticity (proportion of a chromatic colour) C and proportion of black (S). These are entered into the triangle. All colours which lie on the vertical lines — parallel to the black-white axis — contain equal chromatic proportions. In the same way, all colours in the rows running parallel to the line between white and the observed colour contain equal proportions of black. Finally, all colours in the rows running parallel to the line between black and the observed colour contain the same proportions of white (this will be evident from the intersection of rows C and S, and is therefore not explicitly shown). 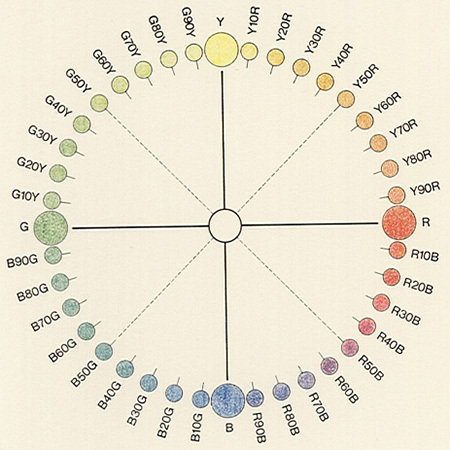 Because it exclusively concerns a subjective response to a colour sensation, the natural colour system succeeds in adopting the positive aspects from Munsell and Ostwald without importing any of their disadvantages. Its creators demonstrate empirically that each perceived colour-surface can be described by quantifying its similarity to four of the six elementary colour sensations, and thus adhere to a strict phenomenological approach. Of course, the natural colour system is not complete. Its extension into the realm of translucent colours, for example, would increase our knowledge both of perception and the visual system. The boundless diversity of colours exceeds the limits of every closed system, even when constructed in such a refined and considerate way. Date: The NCS Natural Color System has been available since 1968/69. Bibliography: A. Hård, «A descriptive colour-system with application for environmental design», Man-Environment-Systems 5, pp. 161-167 (1975); «NCS Colour Atlas», Stockholm 1978; G. Tonnquist, «Das Natürliche Farbsystem NCS», DIN Mitteilungen (Sept. 1986), pp. 462-469.